It is with great pleasure that I announce the launch of SAAKAAR scholarship fund. 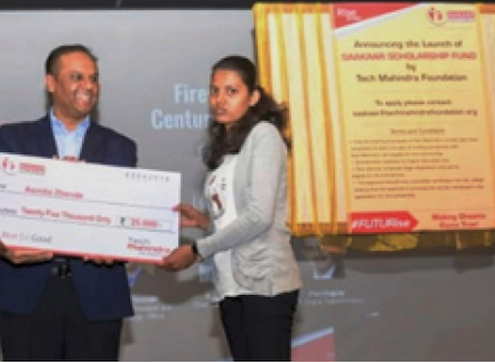 A one of its kind initiative that we have undertaken to support children of the third party staff at Tech Mahindra to continue their higher education. SAAKAAR scholarship fund is an effort to encourage students in their academic pursuits. The first scholarship has also rolled out with a very first recipient being Ms. AsmitaZende, daughter of SurekhaZende, who works at Sharda center, Pune. Being a single parent life was not easy for Surekha but her strong will power never stopped her from educating her daughter. But, after finishing her school, she had no idea how to help her in pursuing higher studies? She was looking for an opportunity when the team SAKAAR reached her and offered the scholarship support. She accepted the scholarship and wishes to make a career in financing after completing her graduation. I am attaching the scholarship details. Kindly disseminate as much as possible in your location and recommend deserving students for the scholarship. I am also attaching a poster. You might like to have it printed at least A-3 size and put up in prominent locations in office.